Mohamed Kallon's 10 million dollar move to Saudi Arabian club Al-Hilal has fallen through. The Sierra Leone captain was to have signed an 18-month contract with the Riyadh team. He says that Al-Hilal allege that after receiving a $250,000 payment from them, he then went on to attempt to sign for rival club Al-Ittihad of Jeddah. Kallon played for Al-Ittihad in 2005, and was in Riyadh last week to undergo a medical examination and finalise some clauses in the pre-contract agreement. Kallon told BBC Sport that following the fall-out, he has been banned from playing in Saudi Arabia for three years by the country's football authorities. 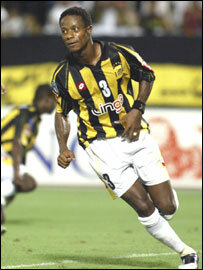 "All the allegations against me are false, I never attempted to sign for Al-Ittihad," said Kallon. "I was not even contacted to give my own side of the story. "The truth of matter is that I went to Jeddah to visit friends and to make sure that my mother, who is performing the Muslim Hajj, is in good hands. The former Inter Milan and Monaco striker has now left Saudi Arabia and is looking for a club elsewhere. "Even if my ban is lifted I've no intention to play in Saudi Arabia again, because of what has happened. "I just want the ban to be lifted for my reputation, and if the Saudi FA fails to do that soon, I'll take the matter to Fifa." "In fact am now considering offers from Qatar."